THE MAN BEHIND ‘Ballyhea Says No’, an anti-bailout group based in Cork, is to run in the Ireland South constituency in May’s European elections. 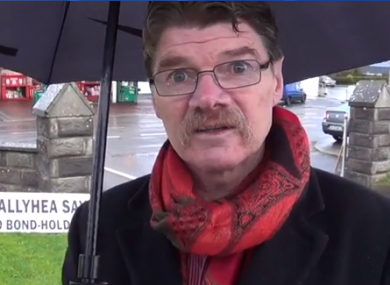 Diarmuid O’Flynn made the announcement yesterday at a march to mark the third anniversary of the ‘Ballyhea Says No’ campaign which is against payments to bondholders and has held weekly anti-EU/IMF bailout protests since 2011. O’Flynn admits he faces stiff competition in the election, but insists he’s “in it to win it”. He is the first independent to put his name forward in the expanded constituency. He will be pitted against Fine Gael’s sitting MEP Sean Kelly and his party colleague, Senator Deirdre Clune; TD Simon Harris; sitting Labour MEP Phil Prendergast; sitting Fianna Fail MEP Brian Crowley; Sinn Fein’s Liadh Ní Riada and Grace O’Sullivan of the Green Party. O’Flynn says he is “very, very pro-Europe” but believes the euro currency has been “disastrous” and that there is a “major case” to abolish it. O’Flynn added that Ireland’s relationship with Europe shouldn’t be a “one way street”. O’Flynn, who is also the Irish Examiner’s chief hurling correspondent, said he will continue writing for the paper until after the hurling league final, before taking annual leave in the weeks running up to the election. He admits that his campaign, which will be promoted through social media rather than election posters, does not have a lot of funding behind it. Email “'From Ballyhea to Brussels': Anti-bailout campaigner launches MEP bid”. Feedback on “'From Ballyhea to Brussels': Anti-bailout campaigner launches MEP bid”.